You're here » Home » Social Media Marketing » Present? Sprout Social for the Win. It’s the great dilemma of the small business: so many social media channels, so little presence. 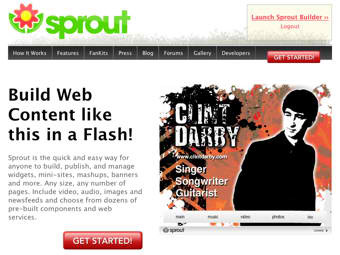 Enter Sprout Social, a comprehensive tool to manage all your social media on one site. Still resisting the social media trend? It’s becoming more and more essential for businesses to have a Facebook, Twitter, or LinkedIn page; your customers expect it. But managing all of that can be a hassle. How do Kanye West and John Mayer do it? Sprout Social, highlighted on Mashable this week, offers a simple, economical (from $9.99 a month, people) way to consolidate those pages to one simple, manageable account. Better than hiring Kanye to do it, right? Read more about Sprout Social here. Headline: Present? Sprout Social for the Win.